Single Turbo RX-7's Questions about all aspects of single turbo setups. Hi how much power can a hks cast manifold handle with a single 44mm tial wastegate adapter before i get boost creep. We did 440 at 12 psi with a half bridge several years ago. Held boost fine with no creep. We have customers with over 500rwhp running the HKS manifold with the Tial 44, no issues. We have not experienced any creep issues even at very low (8psi) boost levels, where it is more likely to happen. Higher boost (20+psi) does not usually result in creep issues. Also no creep.... And mine lasted 12 years with egt temps to 1100*C .
My divided garrett 1.0 turbine housing burned out first.... about two years ago. iv always wondered, whats with the little cutout between the runners on the T4 flange? is it so its betters using an open housing turbo? My theory is the slot between runners on the manifold to turbo flange is there to protect against cracking from severe pressure differentials between runners. The pressures equalize through that passage. I don't think this is a problem if the divided manifold has individual wastegates or even a single wastegate with long equal length runners that equal the length from port to turbo, but it is a problem when runners share a single wastegate with short/unequal wastegate runner lengths. My theory is that since the divider is the hottest part of the manifold... being heated from both sides. It would tend to grow leading to warp (and crack as TII indicated). The T4 divided housing grows and cracks there. Last edited by Barry Bordes; 03-23-15 at 06:57 AM. But the notch has square edges on the bottom which would be a stress riser to thermal cracking making cracks more likely. Interesting, I would assume it would not be so great for use with a divided turbine housing because the gas is going to go through that hole, and run into the divided flange part on the divided turbine housing potentially increasing wear. I also thought it may help controlling boost if one does use a divided housing turbo on it. No, it is designed for a turbo with a divided T4 housing. 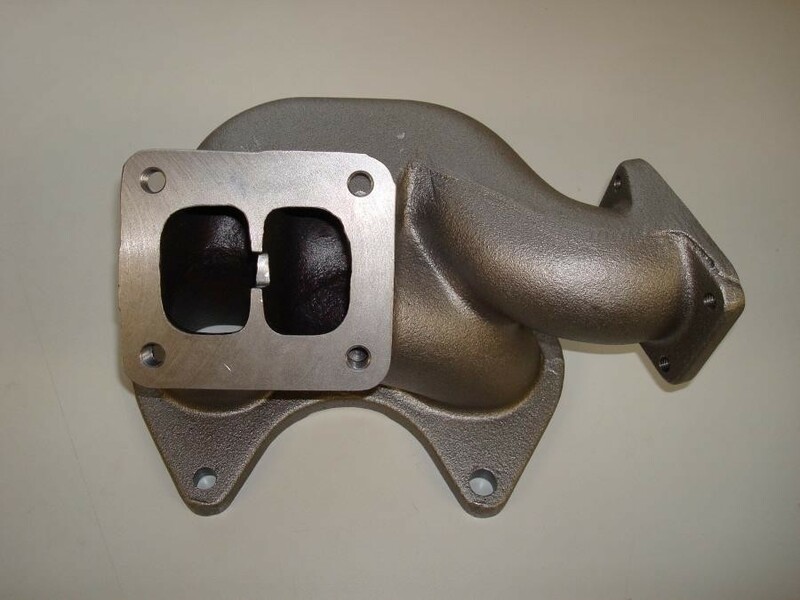 I have never heard of anyone complaining that it warped or eroded their turbo exhaust housing or divided flange gasket. I assume it is because there isn't exhaust flow through that section. Its a good looking manifold. I considered it right up to learning that my turbo would not fit with it.